Ever had a moment where you absolutely had to have a canned drink, but you just had a manicure, painted your nails, or just bit them off to stumpy oblivion? Fear no more! Now, you can save your nails, and if you are queasy whenever you open canned drinks, you don’t need to wince anymore. First off you need to get a straw. Because really, would you like to taste the rat’s droppings on the surface of a canned drink stored in a dinky warehouse? (Uh gee 3 friends forwarded this, it must be true.) Nevermind that boxes of canned drinks are shrinkwrapped in packs of 24! Okay maybe you don’t want to get lipstick/lip gloss on the metal surface and want to look dainty and female by sipping through a straw. Plus it accentuates your cheekbones when you make that sipping expression. Anyway, bend the straw at the halfway point as pictured on the left. Tuck it under the tab. 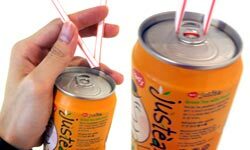 At this point, you can hold the canned drink by the straw itself. This helps if the drink is too cold. Now this is the part where you call me genius. Pull the straw and viola! Your canned drink is now open, and you can enjoy a refreshing cold drink. Don’t worry, I do have more to come in… Albert’s Methods. Yeah. Albert’s Methods. It rhymes! This entry was posted in General, Pictures on June 22, 2005 by 2konbla. ceh i also knowla. i know how to open a pack of twisties with my eyes. you can anot?